$7,500.00 Stalin Prize Medal, 2nd cl., 1942 issue. This is one of the few Stalin Prize Medals earned during the Patriotic War. A very rare award: the 1942 Second Class Medal was issued to no more than 133 people in total. In superb condition, literally impossible to upgrade, at least for a WW2 issue. $6,200.00 Stalin Prize Medal, 2nd cl., 1948 issue. In outstanding condition - one of the best examples we have seen in years. $5,900.00 Stalin Prize Medal, 3rd cl., 1942 issue. This is one of the few Stalin Prize Medals awarded for WW2. The Third Class from 1942 is particularly rare: it was issued to no more than 70 people in total. In very fine condition. $5,700.00 Lenin Prize Medal, Type 1, #498, circa 1960. Note the low serial number. Comes on original Type 1 suspension having complex construction with cylindrical catch. A scarce piece in very fine to excellent condition. $3,500.00 Lenin Prize Medal, #1450, circa mid-1960s. The medallion is in solid 23 K gold. One of the most prestigious Soviet awards, the Lenin Prize was bestowed very sparingly upon top scientists, inventors, writers etc. In very fine condition. $4,700.00 Lenin Prize Medal, #1874, with award document issued in 1965 to a prominent female geologist. The award was bestowed for discovering a highly important mineral field in northern Siberia which to this day provides a significant share of Russia's nickel and copper, as well as other highly prized metals. This is a very unusual award for a woman! Both the medal and document are in outstanding condition. $850.00 Lenin Prize Laureate's ID ("Small Certificate"), issued in 1988 to an Air Force Colonel General, a prominent Soviet strategic bomber commander and chief of a key aviation research institute. The document is in near mint condition. $2,600.00 State Prize Medal, 1st cl., #1821, 1962-1966 issue in solid 23 K gold. In near mint condition - one of the best examples we have seen. $250.00 Award certificate for State Prize, #19754, 1987 issue to a foreman of a construction team in Belarus. A late Gorbachev era award for building public housing and facilities. In excellent condition. 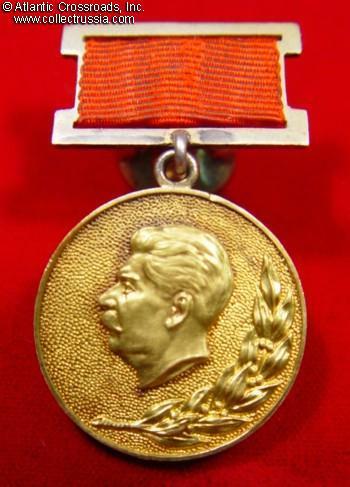 $1,200.00 Medal of People's Performance Artist of the USSR, 1985-1991. Late version without the raised numeral sign and underline on the reverse. In near mint condition. $5,500.00 Medal of Honored Builder of the USSR, #0009, 1989-1991. With only 24 ever awarded, this is one of the rarest of all Soviet decorations. In excellent condition. $160.00 Medal of Honored Builder (Construction Worker) of RSFSR, circa 1970s - 1995. In excellent condition. $75.00 Medal of Honored Employee of Social Security of Ukrainian SSR, 1970s- 80s. In excellent condition. $75.00 Medal of Honored Employee of City Services ("Communal Industry") of Ukrainian SSR, 1970s- 80s. Excellent condition. $70.00 Medal of Honored Coal Miner of Ukrainian SSR, 1970s- 80s. The honorary title was established in 1958, but the medal appeared later, probably in the late 60s - early 70s. In excellent condition. $65.00 Medal of Honored Cultural Worker of Armenian SSR, circa 1980s. Near mint condition. $65.00 Medal of Honored Agricultural Engineer of Armenian SSR, circa 1980s. Near mint condition. $85.00 Medal of Holder of Honored Title of Azerbaijan SSR, circa 1970s - 80s. In excellent condition. $150.00 Medal of Honored Rationalizer (of Technology) of Georgian SSR, circa 1960s-70s. In excellent condition. $290.00 Medal of Honored Inventor of Latvian SSR, 1970s-80s. Very attractive and scarce piece in excellent condition. $90.00 Badge of a Recipient of the Honorary Certificate of the Presidium	of the Supreme Soviet of Estonia, circa 1970s-80s. $130.00 Medal of Honored Builder of Kirgiz SSR, circa 1970s-80s. Uncommon design, different from most other Soviet medals for honorary title holders. In excellent condition. $120.00 Medal of Honored Employee of Moldavian Soviet Socialist Republic, circa 1970s-80s issue. Awarded to holders of "Honored" titles in various fields such as medicine, science, education etc. In excellent condition. $130.00 Medal of People's Performance Artist of Moldavian Soviet Socialist Republic, 1970s-80s issue. Shows MMD mint mark on the suspension. In excellent condition. $160.00 Medal of People's Writer of Moldavian Soviet Socialist Republic, 1970s-80s issue. Mint marked "MMD" on the suspension. Extremely rare award in excellent condition. $195.00 Medal of People's Artist of Moldavian Soviet Socialist Republic, 1970s-80s issue. Mint marked "MMD" on the suspension. In excellent condition. $95.00 Medal of Honored Industrial Worker of Tajik SSR, 1970s - 80s. In very fine to excellent condition. $180.00 Medal of Honored Builder of Bashkir Autonomous Soviet Socialist Republic, #5, 1970s-80s. Note the extremely low, single-digit serial number. $120.00 Medal of Honored Worker of People's Economy of Komi Autonomous Soviet Socialist Republic, circa 1980s. A very scarce medal in excellent condition.